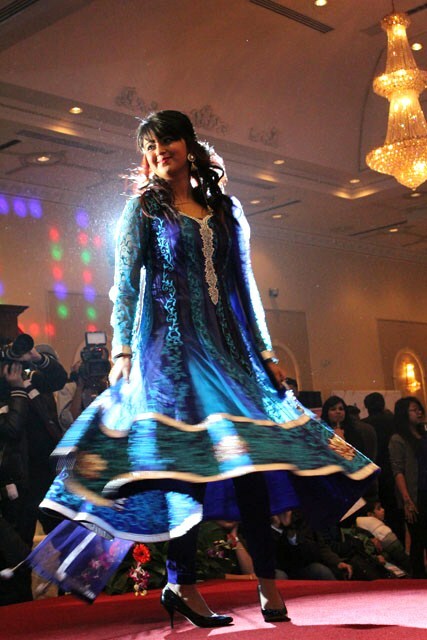 On February 3 and 10, Toronto will host two more interesting Asian wedding shows respectively, the Suhaag and the Kismet. Each is organized by a different wedding magazine. I’m not planning a wedding, I’m just interested in wedding customs and you might find them fascinating too. For many South Asians with a daughter, a wedding could mean bankruptcy as they try to outdo their neighbours in fancy clothes, jewellery, food and flowers. I like going to shows where sponsors are competing for their money, though it’s sad that parents feel they have to blow the budget on a wedding and not a down payment on a house. I love seeing the changes in customs. At Dreams, which took place late January, many of the models looked like they were wearing trousers instead of skirts. I saw for the first time advertisements for live-streaming services. Imagine beaming a Toronto wedding so your relatives in New Delhi can see it live. The Dreams show was an improvement over last year when its fashion show started one hour late. This year it was only 40 minutes late. This year it had male models and a flowers fashion segment. At its jewellery fashion section, the models wore black to highlight the jewels. This year, the show was over two hours long. It’s the only show I’ve seen with bridal dresses from several different cultures — Gujarati, Punjabi, Hindu, Nepali, Pakistani, Guyanian, Hawaiin, “Japanese.” The Japanese gown actually looked Chinese – but never mind. This year, the show incorporated audience participation – three couples competed for thousands of dollars worth of prizes. Contestants had to answer questions like “which of you gets angry first?” by holding up a shoe. Couples had to agree on answers. The fun was worth the $5 entrance fee which came also with a lottery ticket for prizes like a free Indian dinner. Also new to me at Dreams were western-style white dresses on display. If the couple is culturally mixed, the bride might wear such a dress part of the time and an Asian dress for the rest of the time. Two different dresses should please both participating families, said a vendor representing the designer. I could see the dollars adding up. The Dreams show is the smallest of these shows. It offers fewer interesting vendors than the other two. But the embroidery was amazing. The silks brilliantly coloured. The models were lovely, especially these two little girls. And sitting near me were the families of some of the models. It was an opportunity to talk with some South Asian neighbours. For logistical information about the Suhaag and Kismet shows, see: www.TorontoMulticulticulturalCalendar.com February 3 and 10. 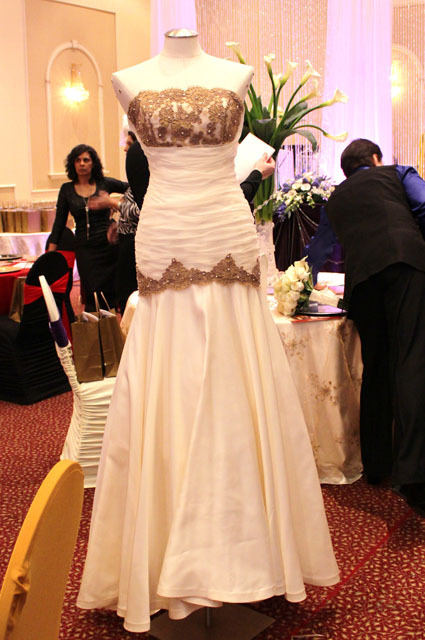 Dreams says Jan. 19. http://www.wherevent.com/detail/Payals-DreamsShows-Dreams-Wedding-Show-2014. Sorry, no information yet about Suhaag. This just in. 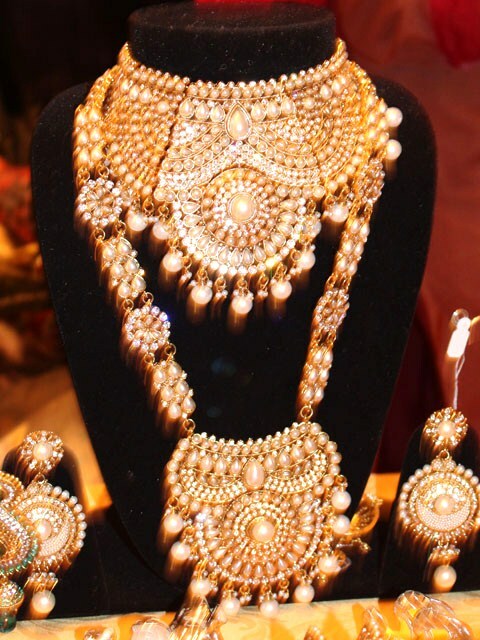 The Suhaag show is on Sunday, February 16, 2014. See https://www.torontomulticulturalcalendar.com. Ruth.